Kumarn Gaem Bum Hua Hlaem (‘Pointy Head Protruding Cheek Bones Kumarn‘), by Luang Ta Chuan of Wat Khwang. 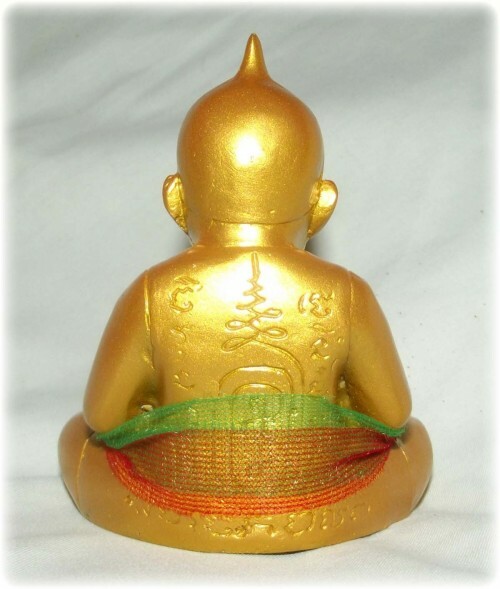 Now those who enjoyed the benefits of bucha to the famous kumarn tong ‘gaem bum’ loi onk mini statuettes of Luang Ta Chuan, can rejoice that we have a bucha size special ongk kroo kumarn tong statue for his devotees to bucha. 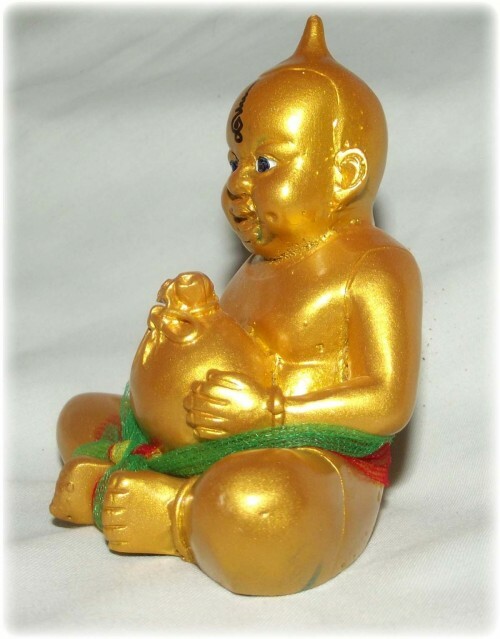 Luang Ta Chuan is renowned for empowering kumarn tong in a way that is like no other, and those who worship his kumarn swear that any thieves or burglars are always thwarted, and that business runs well and smoothly, and regular windfalls arrive. Luang Ta performed the essential invocations of the four elements and the 32 parts of a living being, before calling the prai spirit of the kumarn tong ‘hua hlaem gaem bum’ to inhabit and reside within the amulets. Luang Ta’s method is very different in the sense that he lays down in a coffin to perform the incantations within the Meru building in the temple of Wat Khwang. The kumarn ‘gaem bum’ was empowered with incantations with Luang Ta inside a coffin placed within the Meru cremation building. As Luang Ta performed the incantations, all the lights in the temple grounds went out. The rear side of the kumarn has Luang Ta’s inscription of the yant ‘ta rit reng lap’, which is the eye of power to speed up lucky fortunes. 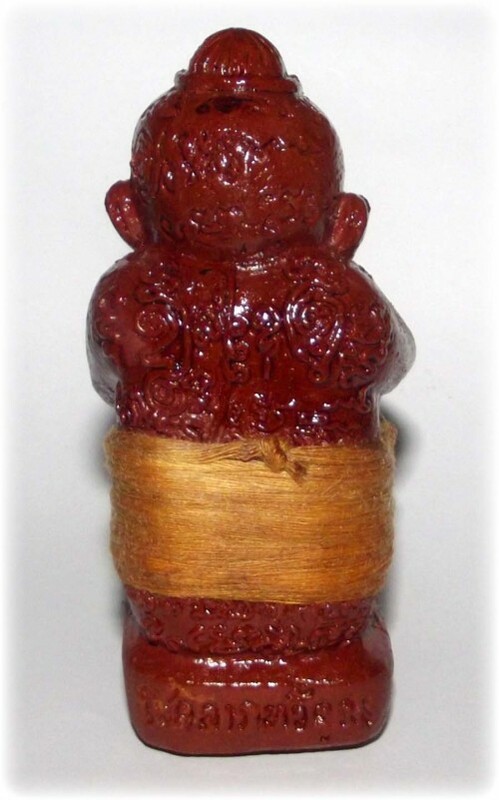 The kumarn tong ‘gaem bum’ is a result of the devotees of Luang Ta Chuan begging him to make another edition after the immense success of his kumarn tong ‘pha daeng’ amulets (kumarn tong with red clothes), where many people won lotteries with after revering the amulet. 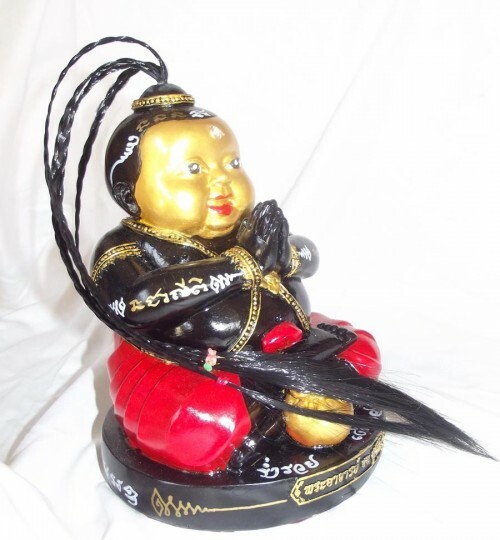 The bucha statue is the result of the looksit repeatedly beseeching Luang Ta Chuan to make something special to guard over and bring prosperity to homes and shops of the devotees. 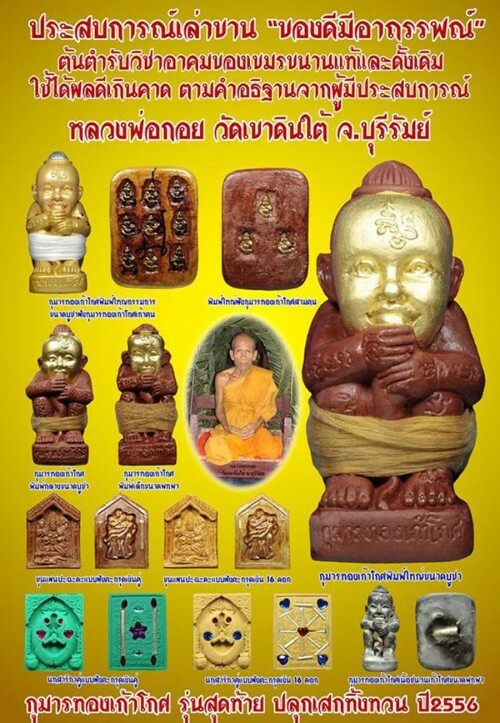 A larger image for bucha on the altar was highly needed, for the kumarn ‘gaem bum’ has become a favorite of Thai kumarn tong devotees, as popular as the wicha of Luang Ta Chuan himself. 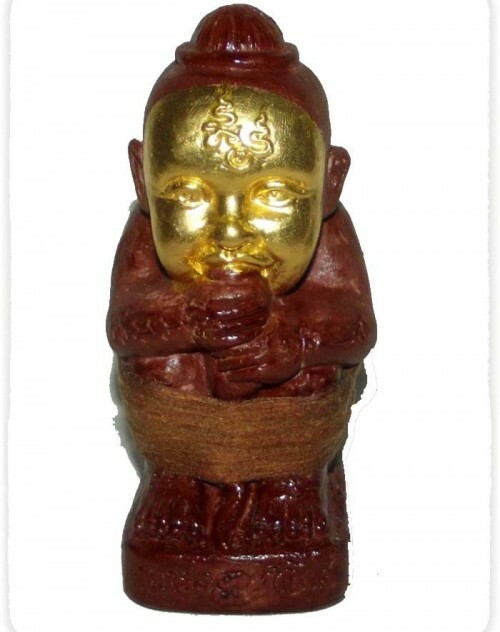 Luang Ta is a master sorceror monk, whose choke lap and maha lap amulets are of the most effective to be found, for example his rian ‘Laekhasart’ lottery coins, and ‘ngern pling’ Laoatian monetary unit amulets which have brought so much success and prosperity to many a merchant and gambler. The base is empowered with sacred powders, and a bottle of prai kumarn powders sealed with a sacred yantra spell on red cloth. Luang Ta says that he had to master the kammathana realizations of asubha kammathaan, and the kumara sadti meditative skill. He had to develop the consciousness of the death state to be able to bcontact and invite the dead spirits of prai and kumarn tong devas to dwell within his amulets. It is necessary to attain arupha jhana and extinguish all sense of taste, smell sound and touch, in order to tune in to the devas of the realms of the dead. 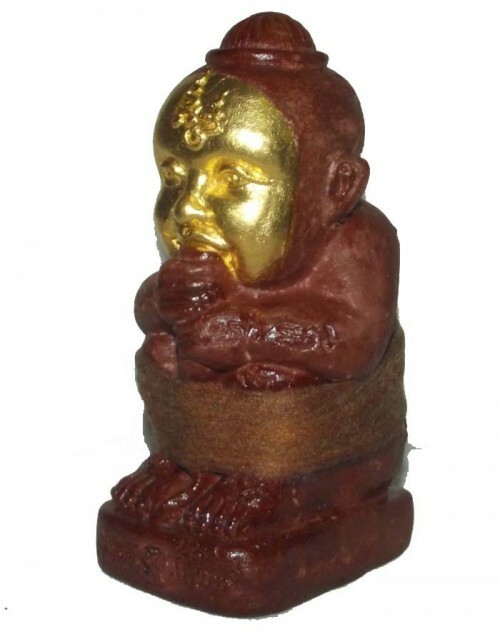 The kumarn ‘gaem bum’ bucha statue has a pointy head and bulging cheeks, and holds a sack of treasure and gold. He is bound with the ‘phaa saam see’ tricolor magical ribbons. Many people believe the bucha image to have considerably more power than the small loi ongk, for the results seen till now, which is saying something, because the loi ongk has already received legendary status since its issue. 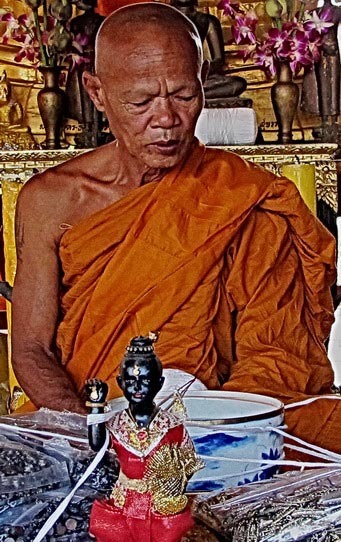 Luang Ta has inscribed a sacred unalome upon the forehead of the kumarn to power you out of instability into stable forward moving prosperity. 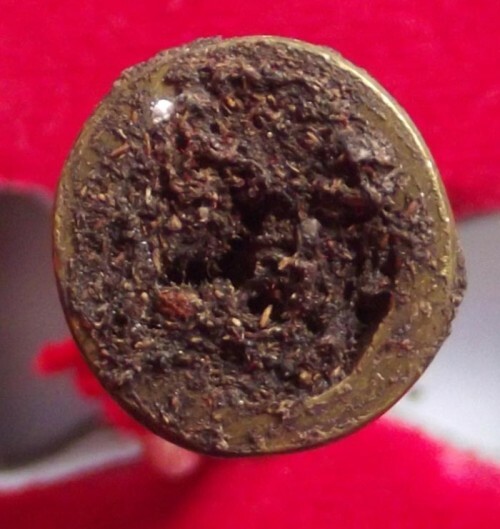 The base of the kumarn is filled with sacred powders and has a code stamped takrut foil and a small glass phial filled with sacred prai powders. The powders within the phial are pure authentic prai kumarn powders. Because of his attainment of these abilities, he performs the successful empowerment of kumarn tong with such ease as to make other master appear unskilled, which is in fact not the case, simply that Luang Ta is one of the world’s top expert masters of this wicha, it is simply in his nature. 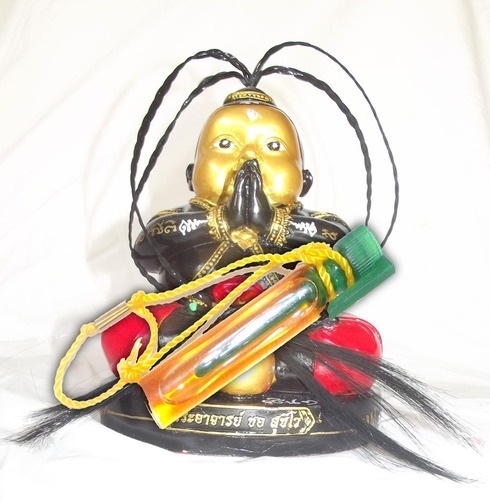 The kumarn tong ‘hua hlaem jao sap gaem bpum’ carries a money bag, and is empowered to assure increase monetary income with the sacred yant ‘ta rit reng lap’ (yant of the eye of power to speed luck and wealth), to make the kumarn prevent you from running out of money and to attract income wherever you go. Luang Ta performed incantations on the statues and amulets, within the cremation chamber of the Meru building for a period of 7 days, and allowed the same number of angelic devas who arrived to assist to also enter the kumarn tong and accompany the amulets as an extra guiding force and protector. 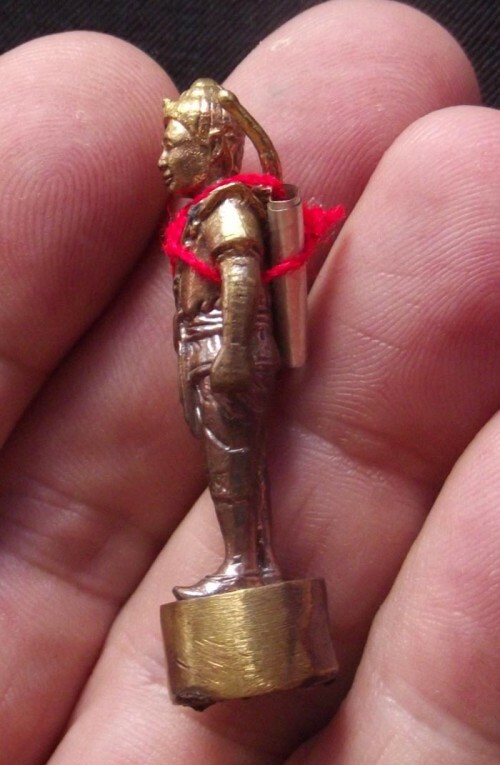 The statues were also made as loi ongk portable amulets, in nuea loha rom dam of which 3352 were made, and in nuea dtakua dee buk (ancient lead) of which only 1352 takrut were made. Luang Ta Chuan is very famous because of his amazing ability to give accurate lottery numbers. 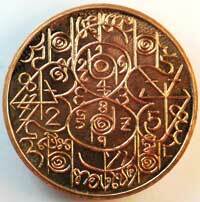 His famous rian ‘hai huay’ lottery wishing coin amulet has had success with several devotees winning lotteries. 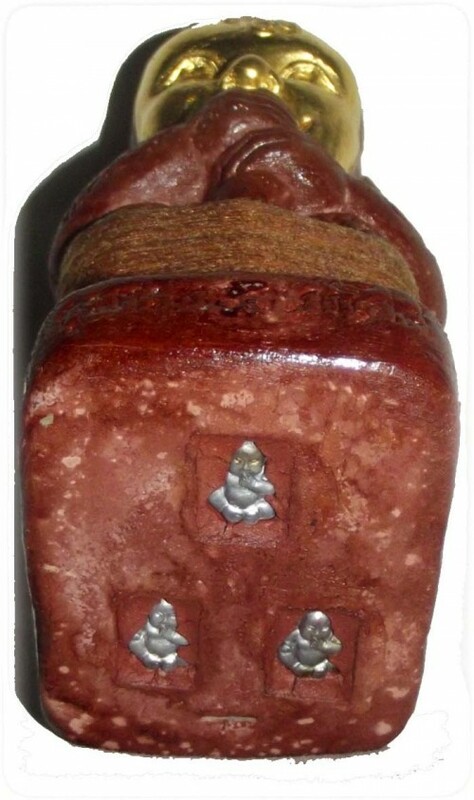 Many of his amulets have reached international fame including the Sivalingk see nang lorm ‘palad khik’ type maha sanaeh amulet which features a metal Shiva lingam encircled by 4 naked maidens. Can be encased in waterproof casing if wished. Offer sweetmeats, drinks and fruits and trinkets, light five sticks of incense outside for informing the local spirits and ruling devas, then light three sticks to inform the Buddha in the home, of the arrival of the kumarn. Use nine sticks to pray to the kumarn. After bucha then pray, and ask the kumarn to fulfill your wish. 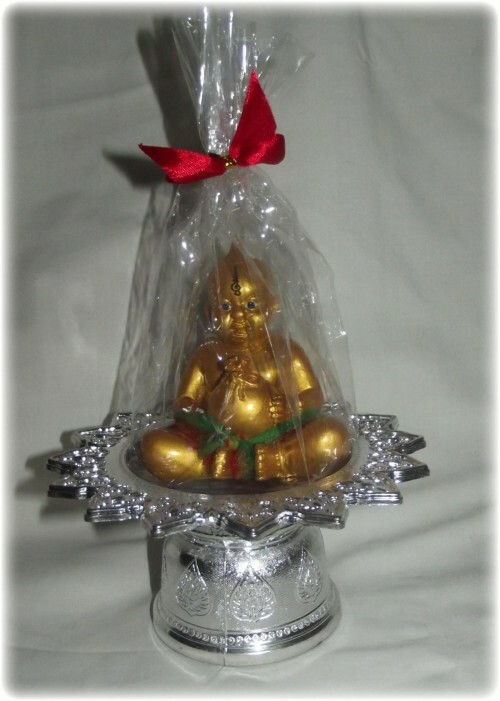 The kumarn can be placed on your own altar, but is also popularly placed on a pan kroo tray, for respectable bucha. The pan kroo in the right size for this bucha (5.5 inches diameter), is available as additional option if you choose, in silver or golden colors. 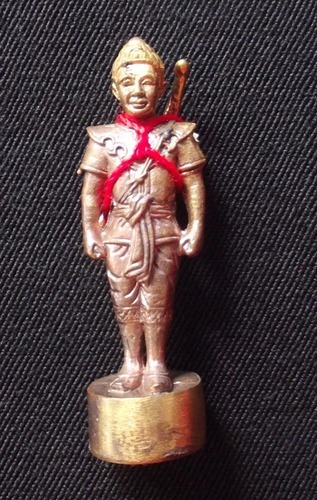 Maker: Luang Ta Chuan, Wat Khwang Temple, Supannburi. Kumarn tong with sorceror powers casting spells. 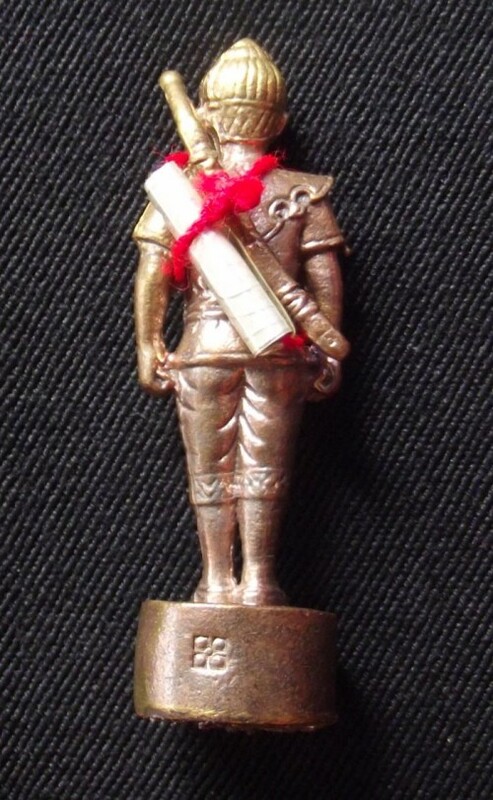 Wicha kumarn tong pha daeng (red pants) with hand inscription of Khom Agkhara spells upon the bucha statue. Pra Ajarn Chor Suchiwo, the master of the wicha Sariga Koo Cheewit who is so highly revered in the province of Maha Sarakam, has created these bucha with the invocation and invitation of special ‘kumarn taep’ (deva kumarns of higher powers) to be the ruling devas of the statues. This means they are not simply phsychically endowed ghosts and spirits, but are heavenly child devas with magical powers of great influence. 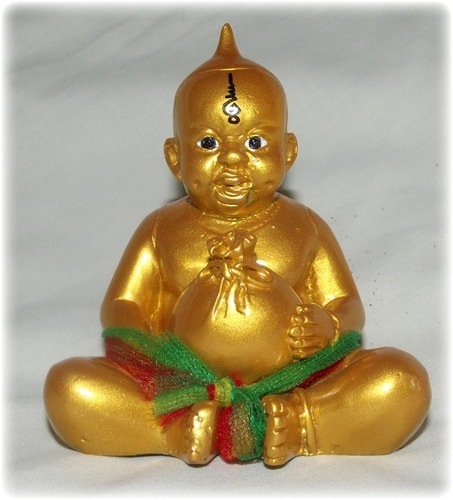 The bucha statue comes along with a phial of prai oil for bucha with anointment, and increased empowerment. It is to be noted that the kumarn taep are devas, not ghosts who lost their life prematurely, as are prai ghosts such as the hoeng prai, and the prai kumarn. The prai ghosts tend to show their powers more easily for any reason, whereas the kumarn taep, will only perform miracles of necessity or that will result in auspicious blessings, but never in suffering, or the breaking of the 5 precepts. The base of the statue is filled with sacred powders and earths with four takrut and ploi sek blessed gemstones. 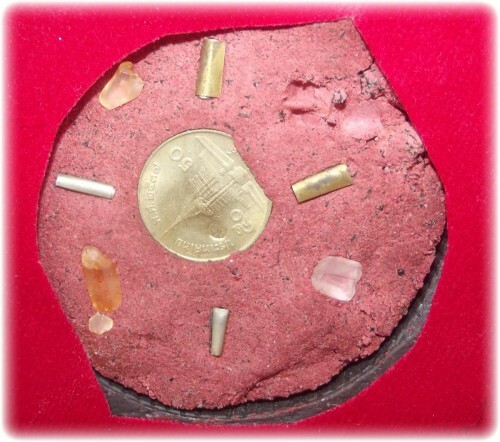 One 50 satang coin is embedded to attract riches and treasures. 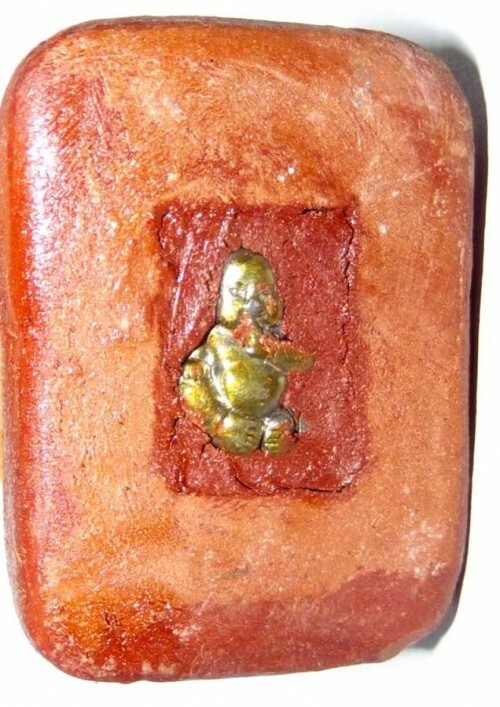 This is the first ever edition of kumarn by Pra Ajarn Chor released to the public, and is therefore a definite recommendation for collectors, for it will become an important item in the dtamra of amulets of Luang Por Chor, and is indeed a most attractive, and powerfully imbued image that is filled with sacred muan sarn and ploi sek gemstones for maha pokasap magic. 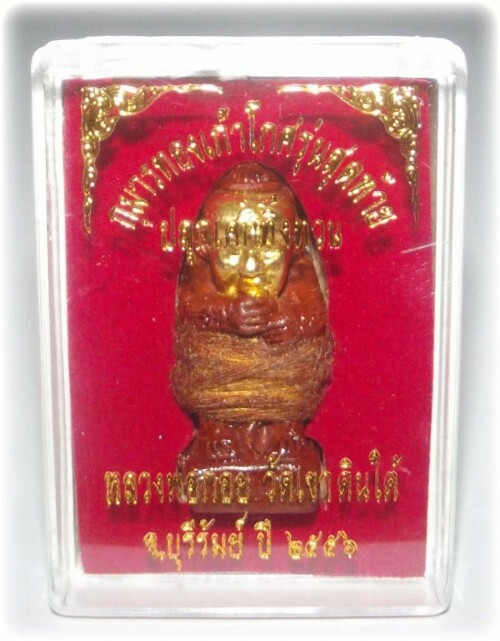 Maha pokasap magic is amplified by the crystalline power of the blessed gemstones, which imbue the muan sarn prai powders stuffed within the base of the statue with a powerhouse of radiant aura with maha sanaeh and maha lap energy. Offerings are easier than many kumarn, simply keep a fresh glass of water always ready and some red syrup drinks or other sweet drink will do, some sweets and goodies, trinkets or toys. The first time you perform Bucha you should offer red drink, a glass of milk, a glass of water, and sweets or cakes, and a flower garland. Light nine sticks of incense, make and speak out your wishes, take the oil and smear a little on the kumarns forehead on the gemstone third eye. Chant the kata whilst doing so. The oil** remaining on your fingertip after anointing the kumarn‘s forehead, is of course senseless to waste, and has auspicious intent from you to the kumarn, and auspicious blessings and appreciation from the kumarn to you in it, so you should use what is left on your finger to smear on yourself, for metta maha sanaeh choke lap. The bottle of oil itself, can be placed on a pan kroo tray for bucha (increase power). It doesnt have to be used to smear on the bucha and/or yourself only, but can also be simply carried or make bucha on its own altar or in your shop. 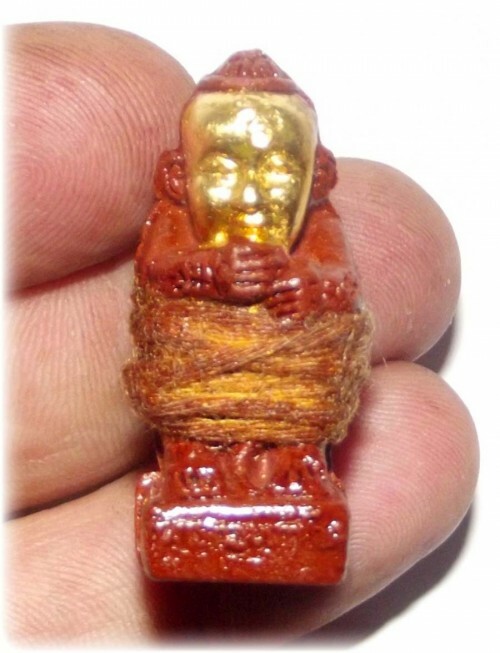 It is however most advisale to use as Luang Por advises as anointment for the kumarn, to empower the pokasap gemstone in its third eye, to spy out the treasures that others have not seen, and pick them up as opportunity knocks. The kumarn can also be placed upon a pan kroo tray if wished, which is always a very auspicious way to keep bucha images, small or medium. For gambling: If an oil is given for gambling purposes, simply tap the see pheung, metta oil or prai oil with your finger and make a wish before leaving the house. You can rub the balm into your skin of your gambling hand then, if your finger has some balm on it after tapping. Use only a tiny amount of balm is enough. For ‘jerajaa’ (business discussions, job interview, etc. ): smear the balm onto your forehead and make your wish. For maha sanaeh (attraction): smear the balm under your chin, and ear lobes, and make your wish. For kaa khaay (selling wares) : smear a little on your wares or the table where you sell them before each day begins and chant the Kata given. For mad jidt mad jai (enchant the heart and mind of another): smear or dab a tiny bit on the person and then perform the chanting of the incantations given for the oil, and focus on the person coming to you as your wish. ** We always have spare oil to replace for anointment of kumarn or other prai devas, and also pure Buddhist anointment balms, at reasonable prices if you run out, just ask us by email if you need anointment oil refills. You can also use Ajarn Spencer’s python prai oil which is rich in prai kumarn ingredients (due to fanatic interest in seeing how powerful one can make a potion), as well as many powerful herbal extract for maha lap and metta. Ajarn Spencer also uses it himself to anoint his images with. In fact, this is why he made the oil, but once he found it to be effective, he decided to distribute, after testing some free samples with some looksit. He distributes it at a much lower price than is usuallly possible, for he has no middle man between those who use his amulets, and himself. This is something Ajarn Spencer has always stuck by, to remain non commercial in his own practice and amulet making. Prai Tong is not a simple Human Prai Ghost, but a deva of a Higher Celestial Realm than this who is accumulating Merits by spending time helping Humans to alleviate their sufferings, be bringing riches and treasures and protecting from evil and dangers. The Prai Tong is considered much easier to maintain than a Kumarn Tong, because a Kumarn Tong is still a Child and prone to be naughty and sometimes unfaithful or to escape the house and go out to play. If a robber, or Magical Curse such as a Kwai Tanu enters the house, it may not see the Kumarn Tong or not, depending on whether the Kumarn is at home or not. 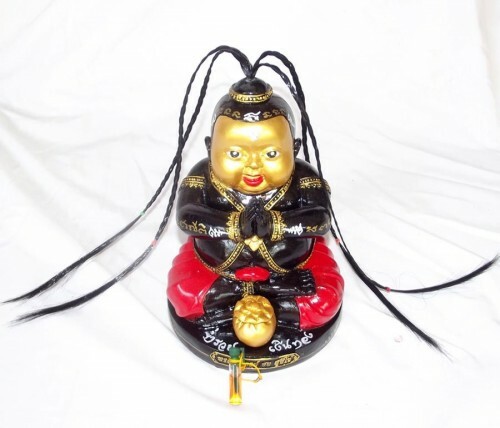 But with the Adult Prai Tong Deva one is treated with pure Loyalty and the Prai Tong will always be there to watch over the Household, and never become Unruly as is the case with Kumarn Tong, Children being Children. In Truth, Ajarn Tong Teng did not directly create these images, but recieved them from another Ajarn whom he says had already empowered them very well indeed, but that he did not decide to empower further, and release them to the Devotees for some years since he has had them. 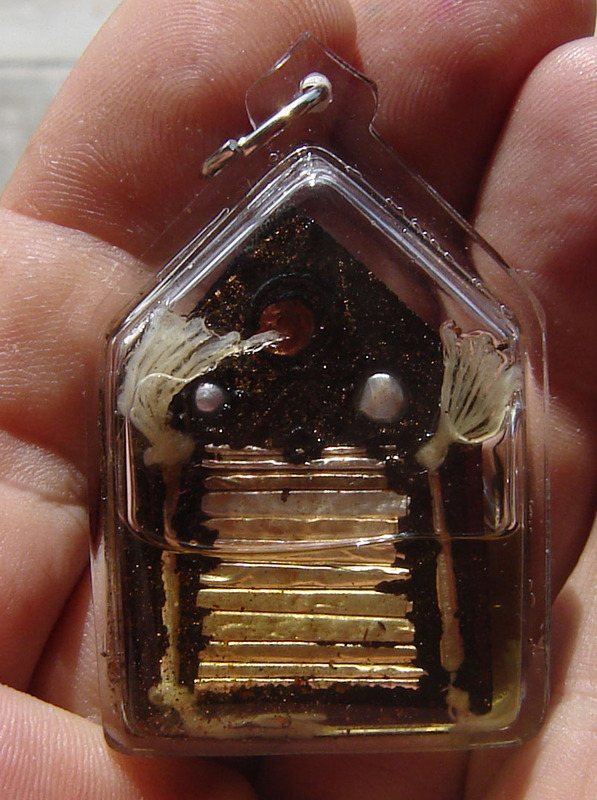 There were around 150 of these amulets in total, and date back to the early Years of Ajarn Tong Tengs Magical Trajectory. They can be expected to become both Classics, and Essential Rarities. The Prai Power and ease of use of the Prai Tong Yord Taharn is the perfect accomplice in life, complimented by its originality, quality of creation and aesthetic design, Sacred Ingredients and Authentic Magical Empowerment using a true Ancient Khmer Sorcery Spell. 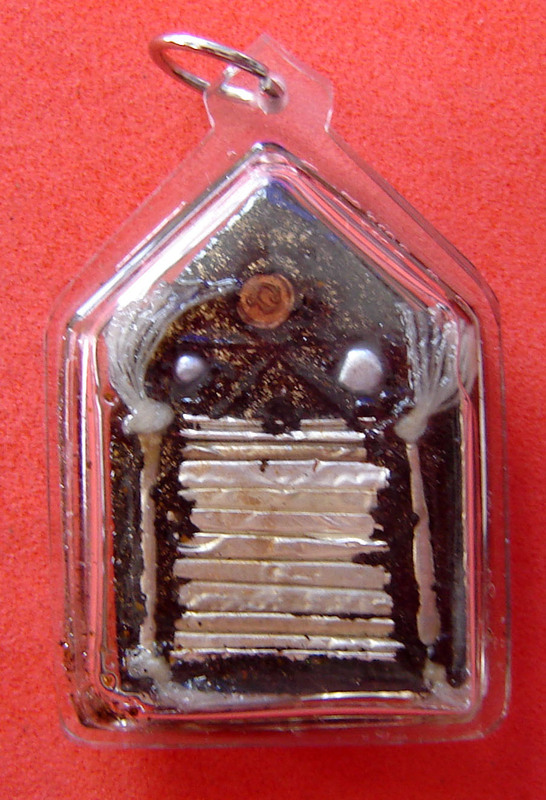 Comes with Original Temple Box – can be Encased if Desired. Apart from wearing the Prai Tong as an amulet or keeping it standing on the altar as a Bucha statuette, there is an alternative way of making Bucha to the Prai Tong which is even more powerful when Prayers are performed. Place the Prai Tong immersed in ‘Nam Man Jantr’ (a perfumed flower oil used in amulet making and in Sacred Offerings, and Anointment Ceremonies). 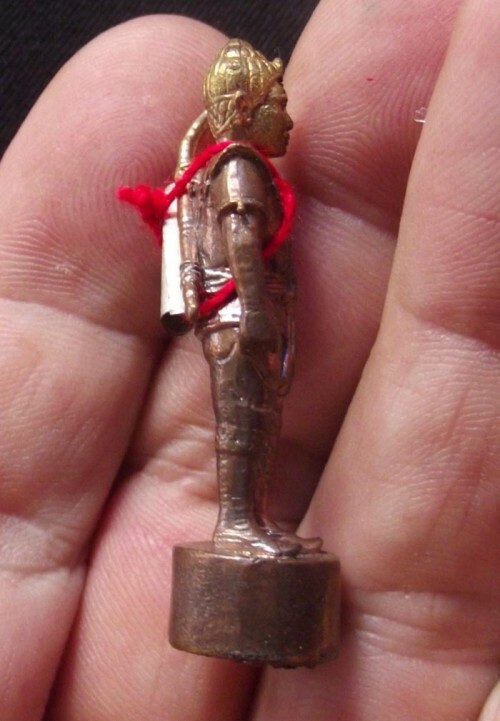 You could also simply smear some Nam Man Jantr on the statuette when Praying to it on the Altar, or before and after wearing it as an amulet*. 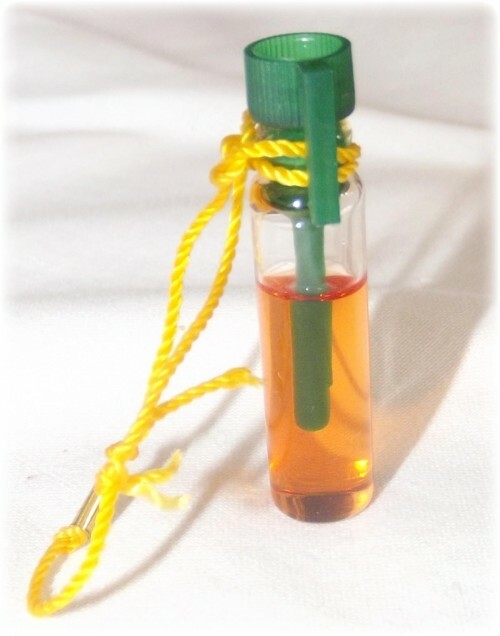 * In Truth, you can use this Oil Anointment/Immersion method with many Thai Buddhist Amulets. 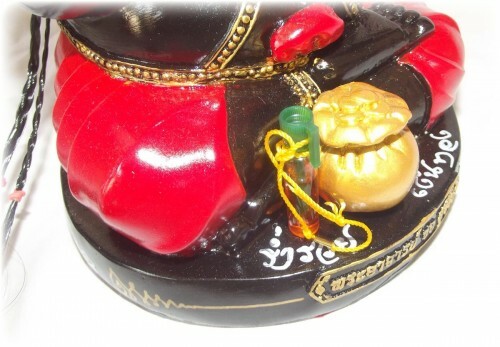 This Edition was only released after a Devotee who distributes Ajarn Tong Teng’s amulets to Local devotees in his District saw them underneath some other amulets inside the container they were hidden in. The Devotee the begged for Ajarn Tong Teng to release them. Ajarn Tong Teng had been convinced of these amulets since the day he was given them, but did not know exactly how to release them without revealing the name of the other Ajarn, whose name remains a Mystery, but whom Ajarn Tong Teng seems to feel very convinced about his Magic Power, and Honors him by using them to Empower further and release to his Looksit with Confidence. We are lucky to have unearthed a few examples of this unknown early edition, only just released in 2555 BE after their Discovery. The Serm Duang Kong Grapan and Klaew Klaad qualities of Por Gae Ruesi Deity combined with the auspicious and Riches bringing Metta of the Gumarn Tong, this hand made and personally empowered amulet from Ajarn Thoy, is a true hand made sacred amulet using sacred powders and ‘Wan’ (magical herbs) which Ajarn Thoy has learned about and collected over decades to make thes special amulets. 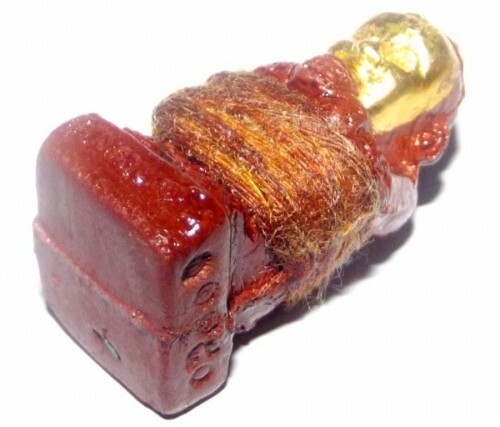 It is hard to find ancient hand made traditional amulets in the Modern Era, but Ajarn Thoys amulets are an exception to this rule. Comes in sachet with picture of Ajarn Thoy. 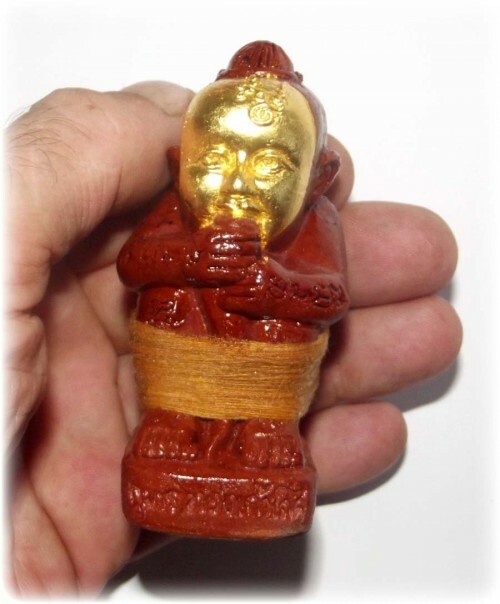 Free Pha Yant of Gumarn Tong Por Gae from Wai Kroo 2011 Master Day ceremony as a special gift from Ajarn Spencer Littlewood and Ajarn Thoy is included with this amulet. 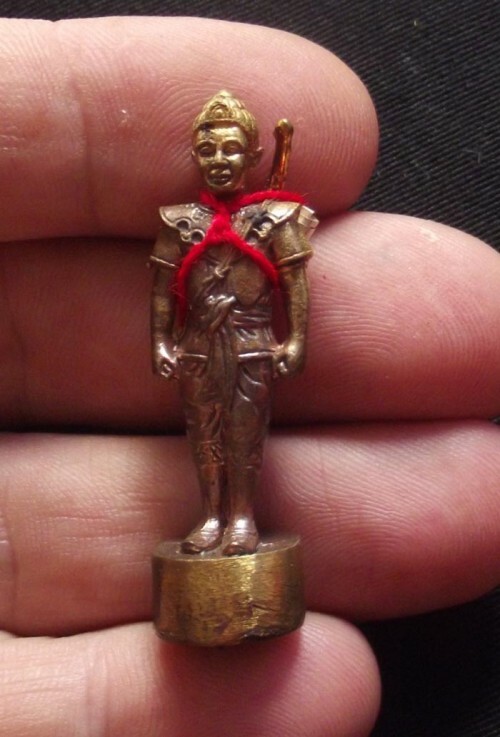 Samnak (Ashram) Kong Waet in Ang Tong is a small Dtamnak Ruesi that performs various Yogic and Magical services – Astrological readings, Sak Yant magical tattooing and special magical charms and amulets, such as this Gumarn Tong. 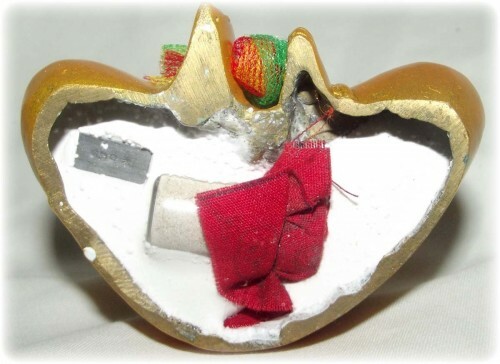 The Gumarn has been made according to the Wicha of the Samnak and has sacred powders, Takrut and a Gumarn effigy inserted into the base of the statue. Ajarn San Kong Waet – Brahman Sak yant Master of Ang Tong District. He learned his Wicha from his Grandfather, who was a learned Adept in Saiyasart who had inherited Wicha from Luang Por Tuad himself. His teacher was a Sak Yant Master too, which is one of the Wicha which Ajarn San has inherited from his Grandfather. He also recieved Wicha from studies under Luang Phu Hnay of Wat Ban Jaeng in Ayuttaya, and Khmer Master Ajarn Bun, Luang Por Yib (Wat ban Klang). 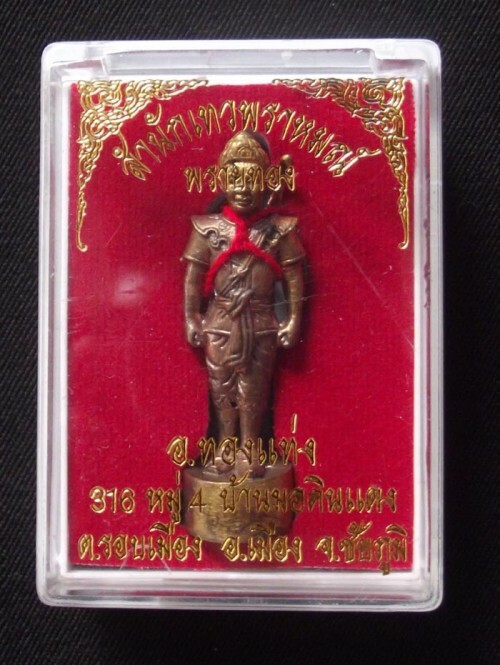 He was given the Wicha from Luang Phu Tammachote of Wat Kaay Ban Rajan Po Gai Dton and Wicha from the lineage of Phu Suea Mahesworn (a famous Outlaw of the second world war times that is now a famous and respected Guru Monk). 3 inches wide base and 5 inches high Takrut, sacred Gumarn powder and white robe from Ajarn San is inserted into the base of the Gumarn. Gumarn Tong Gao Prai Dtaanee Nuea Dtabpoo Chae Nam Man Gao Prai Dtaanee – Luang Por Sanaeh Jantr – Wat Jantrangsri, of Wat Ban Hnong Jote, Khon Gaen. Ninefold Dtaanee tree magic spell with Gumarn Tong honed from coffin nails soaked in Gao Dtaanee Prai Oil, or Powder amulet Gumarn Tong Gao Prai Dtaanee Nuea Din 7 Pah Cha Chup Nam Man Gao Prai Dtaanee. 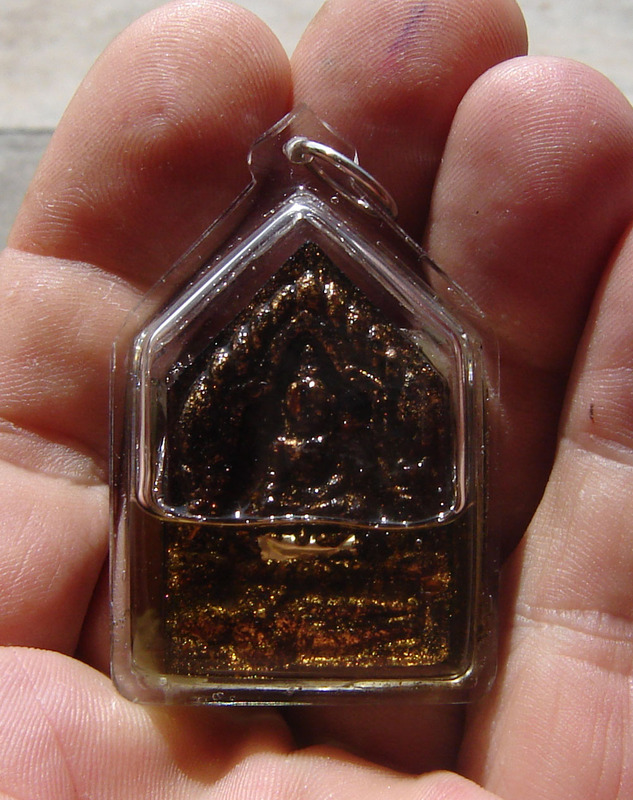 Powerful Love Charms from Luang Por Sanaeh Jantr. 199 Oil Flasks and 999 powder amulets made in this limited edition of powerful Love Charms for Great riches and Lots of Lovers. Wan Sanaeh Jantr Daeng, Wan Sanaeh Jantr Khaw, Wan Sanaeh Jantr Horm, Wan Gwak Ngern Gwak Tong, Wan Tung Ngern Tung Tong, Wan Saethee Rap Ngern, Wan Maha Saethee, Wan Gorb Sap, Wan Serm Choke Serm Laap. Mai Koon Dtaay Prai, Mai Khanun Dtaay Prai, Mai Yord Dtaay Prai, and various other secret powders and herbs, such as earth from 7 cemeteries, 7 marketplaces, 7 ports, Gai Gug powder…. 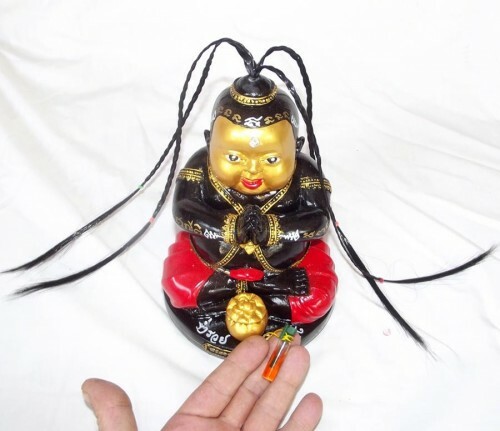 (ask for luck and wealth, good business and easy success).